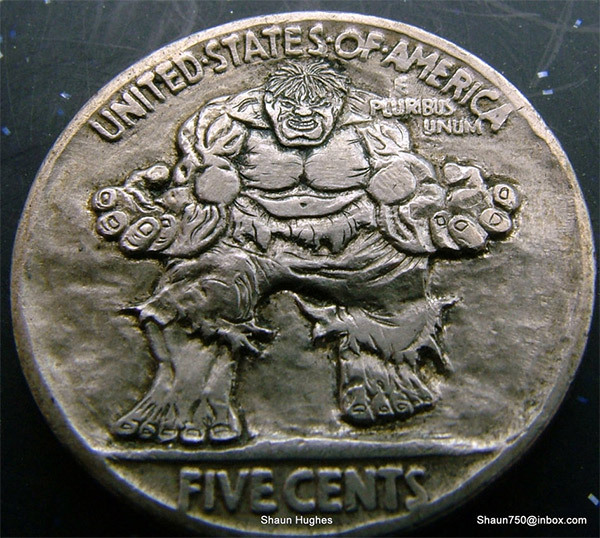 No 'Hobo Nickel' isn't the Hobgoblin's cousin, rather a cult hobby, where sculptors creatively modify small coins of various denominations into unique artworks. Low cost and portable, the medium was popular amongst Hobo's, hence the name. See? IADW can be edumacational! Anyways, on to the Hulk. Shaun Hughs carved the above ultra-detailed image of the Jade Giant onto a 1935 Buffalo/Indian Head 'Hobo Nickel', and now has his radioactively cool canvas up for sale on ebay. So tempted to say "I'll buy that for a dollar!" :) This level of workmanship is completely beyond me, I'd be more likely to shell out more for it. If I could get away with it. Darn adult responsibilities. Although, if you were to put this particular piece on the railroad track, it would bring new meaning to "Hulk smash!" wouldn't it? It never is Dan. In fact, sometimes it can be therapeutic. I know it makes me feel better about the fact that I no longer snort coke...oh wait. No, that wasn't me. Maybe I have watched it too many times.